Wow. I was not expecting to love this so much. Honestly I’d not heard of this book before the film came out earlier this year. I really enjoyed the film, it’s the most unique and interesting Sci-Fi film in a long time. I had to read the book it was based on. I’m so glad I did. The film is good, but the book is so much better. I know that’s a cliche, the book is always better, but it couldn’t be truer in this instance. The book is written in the first person, from the viewpoint of a woman who only refers to herself as The Biologist. She is one member of a team sent into Area X to investigate the strange place. That’s all I’m going to say without spoiling it. The book is short, but it doesn’t feel rushed or incomplete. It actually works as the story is presented as if it’s been written in a journal that all the characters own and write in. That does mean you know from the beginning that the protagonist survives to the very end of the narrative, but at the same time you become aware very early on that death isn’t the worse thing that can happen to you in Area X.
I honestly thought this book was going to give me nightmares when reading it late at night and I had to put it down because, I was either going to have nightmares and not sleep, or read the whole book and not sleep. It’s that good. There is one section, in the lighthouse, which is so tense I was almost holding my breath the entire time. It’s been a long time that I’ve put off doing other things and prioritised reading until I was finished. I honestly couldn’t put it down. 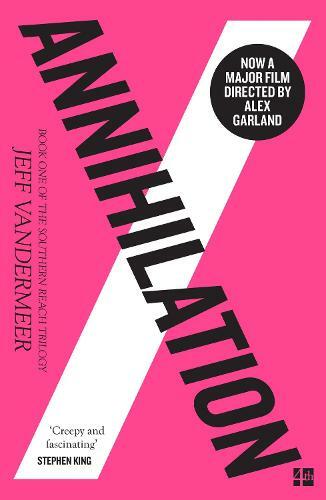 Annihilation is tense, scary, interesting and honestly unputdownable. It’s book one of a trilogy and I straight away ordered book 2, Authority, and can’t wait to start it. This entry was posted in Uncategorized and tagged Book, Book Blogs, Book reviews, Books, Novels, Reading, Reviews, Sci-fi, Stories, Writing. Bookmark the permalink.